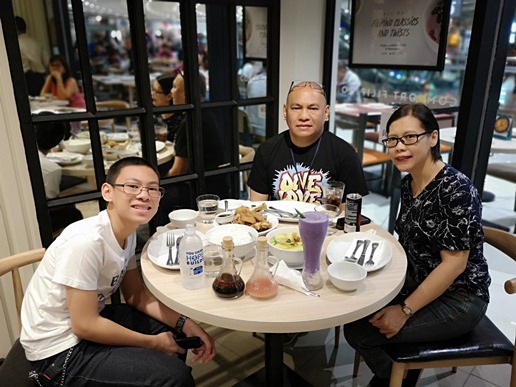 It was November of last year when we first spotted Manam Café at SM Megamall. After a tiring Family Day in Pisay that left the oldies (hubby and me) exhausted, we took a long nap before setting out to look for a place to eat. Our hungry tummies led us to try Manam Café’s food offerings. We ordered Laksa-Style Halaan Soup with Crispy Sili Leaves & Mais plus Crispy Pata with Garlic-Chili Bits. We also tried their Ube + Sago. This item on Manam Café’s menu caught my eye. What a delightful way of serving halaan soup – with coconut milk! Hubby and I approved of it, but we both wished we were having hotter/warmer soup. Not really sure if my “snap first, eat later” attitude had something to do with this. Lol! 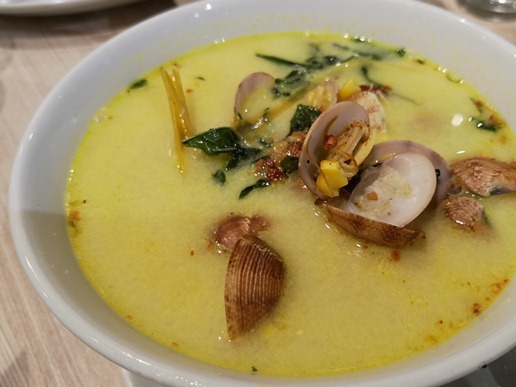 We would love to have this Laksa-Style Halaan Soup with Crispy Sili Leaves & Mais again. 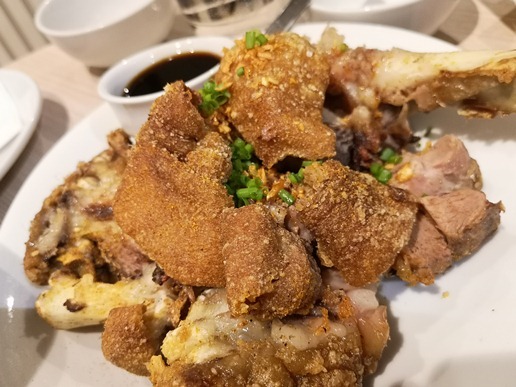 This Crispy Pata with Garlic-Chili Bits was indeed crispy. It was also an excellent complement to the halaan soup, but it’s lightly salted, so best to dip it in the accompanying soy vinegar sauce. 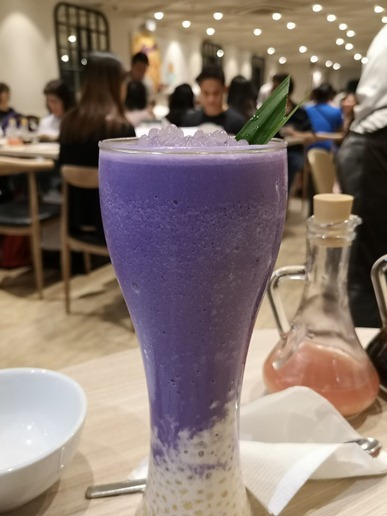 This Ube + Sago shake was already my dessert. It was lightly sweetened, which I liked. Even my son enjoyed it. Hubby tasted it, too, but he said he wanted it sweeter. Manam Café’s menu looks really promising, and by the looks of it, this won’t be the last time we’re dining there. Extended Until January 29: 7-Eleven’s MONEYgayang Pasko at MONEYgong Bagong Taon Promo! Do you want to be a millionaire? Well, with 7-Eleven’s extended MONEYgayang Pasko at MONEYgong Bagong Taon promo, that dream might just come true! All you need to do is purchase any item worth at least Php100 at a 7-Eleven store branch anywhere in the Philippines. If you’re a CLiQQ member, you earn one (1) e-raffle ticket with every P100 purchase when you scan your CLiQQ rewards barcode before payment. Non-CLiQQ members can also join the raffle. Here’s how: Write your name, address and contact number at the back of your receipt, affix your signature, then drop your accomplished receipt in designated drop boxes. And what’s more, CLiQQ members get to earn instant or additional e-raffle entries when they buy booster products! 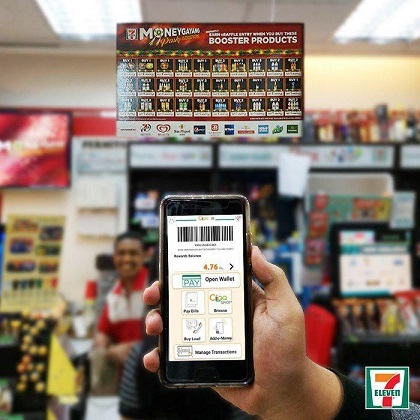 So remember to keep your eyes peeled for these items whenever you visit a 7-Eleven store! Amazing cash prizes await lucky 7-Eleven customers! Three winners will go home with Php1,000,000 each, 40 winners with Php50,000 each, and 250 winners with Php10,000 each. That’s a surefire way of welcoming 2019 with a bang! So what are you waiting for? Head for the nearest 7-Eleven store and shop now! Who knows? You might just be a millionaire this year! The MONEYgayang Pasko at MONEYgong Bagong Taon promo runs until January 29, 2019. For more information, visit 7-Eleven’s official Facebook page at https://www.facebook.com/711philippines/. Nothing beats celebrating the holiday season with a bountiful feast shared with the people closest to our hearts. At Cucina, located at the Marco Polo Ortigas Manila, we can savor our all-time favorite holiday treats that will surely bring happiness to us and our loved ones. 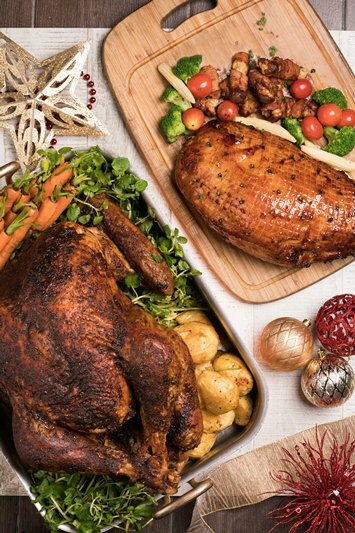 As Marco Polo Ortigas Manila transforms to a Whimsical Winterland, the culinary journey brings indulgent dishes to life as they leave their own brand of magic on one’s taste buds. Christmas Eve dinner buffet showcases a wide array of delectable dishes, like the Roast Angus Beef Rib Eye, Caramelised Ham, and Crispy Duck Breast on Mango Basil Sauce. For the traditional Noche Buena, enjoy a midnight spread that includes Filipino signatures Pancit Palabok and Cebuano Pork Humba, plus the Staple Bibingka and Puto Bumbong. Sumptuous dishes await the coming New Year as well. Media Noche dinner features Iberico Pork Loin with Apple Sauce, Chinese Barbecue Duck, and Gratinated Prawns, Mussels, and Salmon with Wholegrain Mustard Cream. Have a feast of Orecchiette with Pepperoni and Tomatoes and Roast Leg of Pork for New Year’s Day. Cucina is open daily for lunch from 12:00 NN to 2:30 PM and dinner from 6:00 PM to 10:30 PM. Midnight buffet starts at 11:00 PM on the 24th and 31st of December. Holiday rates are as follows: Php 3,800 for Christmas Eve Dinner, Php 1,800 for Noche Buena (Midnight) and Php 2,888 for Christmas Day. New Year’s Eve dinner, on the other hand, is available at Php3,800, while New Year’s Day rate is Php 2,888 per person.